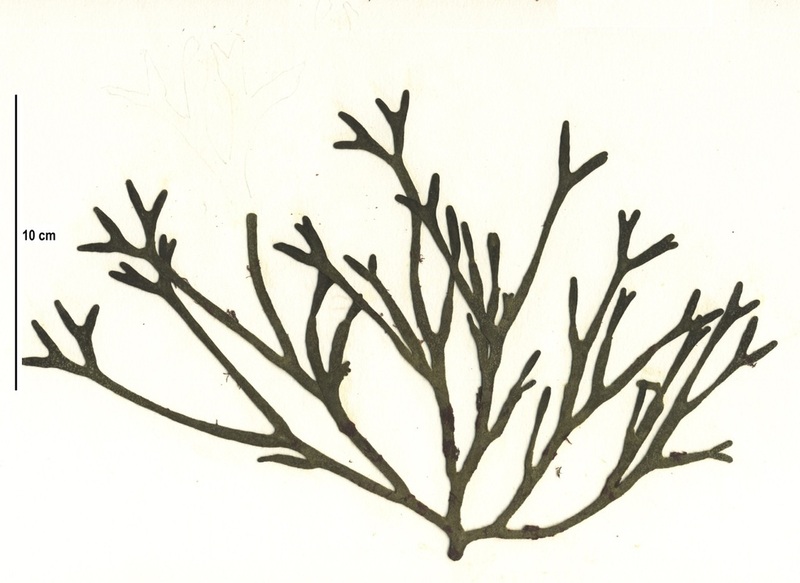 Left: sea staghorn specimens from Calvert Island beaches; collection numbers SCL15274 (top) and SCL 15326 (bottom) in the UBC Herbarium Algae Database. Photos by Sandra Lindstrom. Search the collection numbers in the database for further details on these specimens, or search this species for additional occurrences. Centre and left: sea staghorn playing host to epiphytic red algae. Photos by Georgia Brander (top centre), Martina Beck (bottom centre), and Christina Meschkat (right). This green seaweed is deep green to almost black in colour. Its tubular thallus branches in a forked (dichotomous) pattern. The branches are tubular and generally around 6 mm in diameter, though they can be up to to 1 cm. The whole specimen may be up to 30 cm tall. 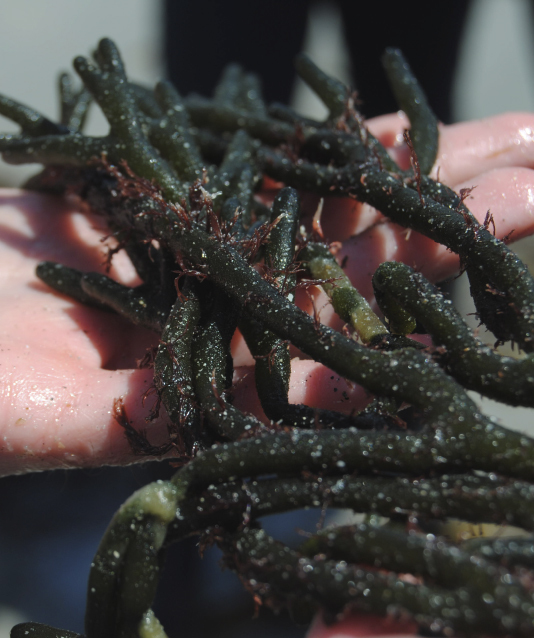 This seaweed has a distinctive fuzzy or felty texture, which distinguishes it from most other seaweeds. 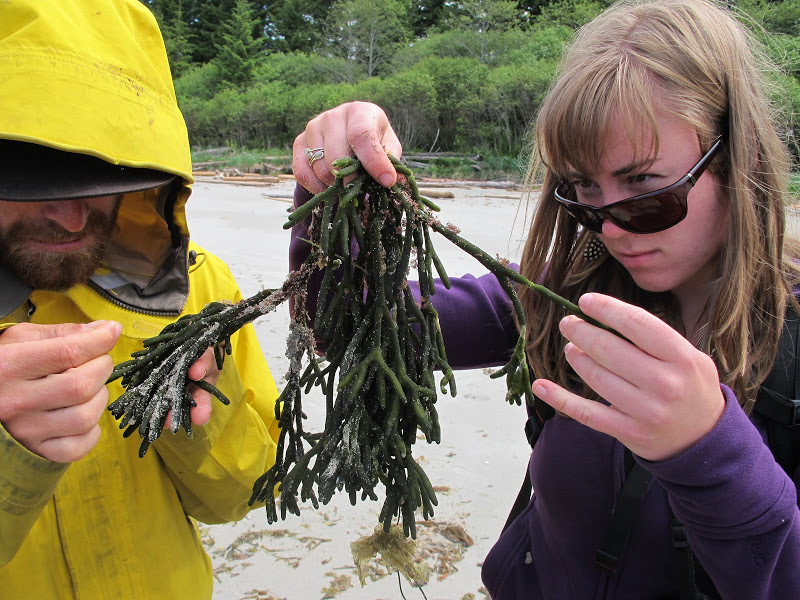 This species is found in the lower intertidal to subtidal, on rocky open coastlines. Though the species C. fragile is found in many regions worldwide, the subspecies of North America's west coast, C. fragile ssp. californicum ranges from Alaska south to Baja California, Mexico. It is native to this range. Sea staghorn is used in skin care products, and is eaten in eastern Asia. The identification of this species can be complicated by its numerous common names. 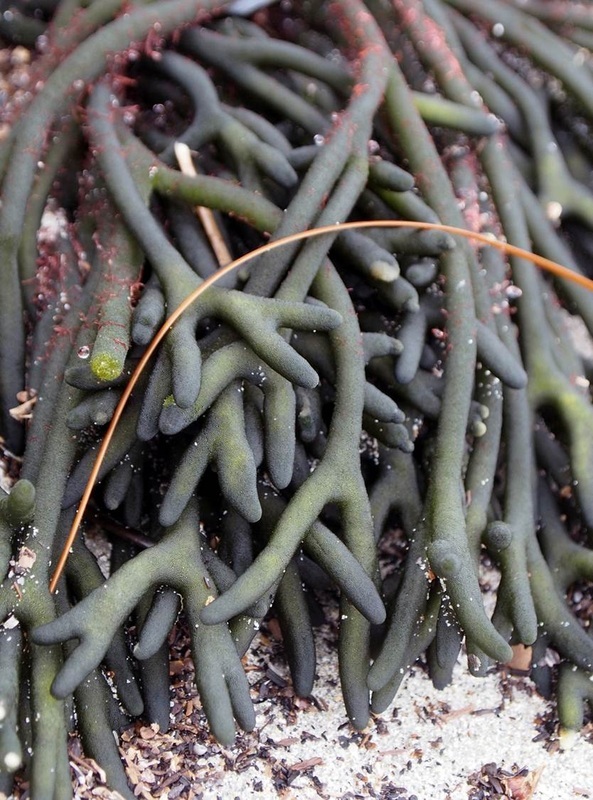 In addition to the names listed above, it may be known as green sea fingers, felt-alga, green sponge, and green fleece — though these names are not as commonly used. There are numerous subspecies in different parts of the world, which are listed on the World Register of Marine Species. 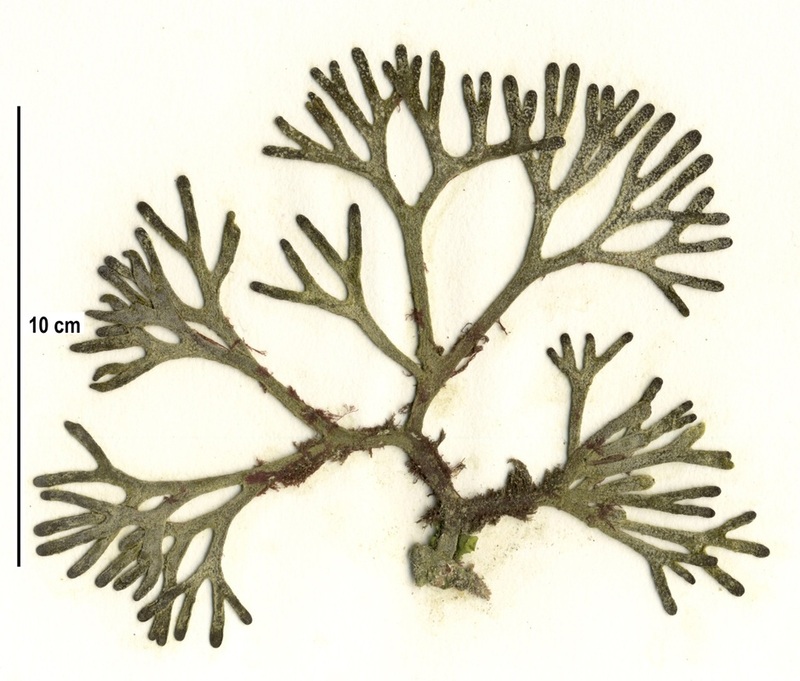 Some subspecies of sea staghorn are considered invasive in various regions around the world. C. fragile ssp. fragile (formerly ssp. tomentosoides), native to the Pacific coastline in Asia, is invasive in many regions around the world — including Europe, where it is considered to be one of the worst invasive species. Harbo, R. M. (1999). Whelks to whales: Coastal marine life of the Pacific Northweest. Madeira Park, BC: Harbour Publishing. P. 202. Codium fragile. Seaweed Industry Association. Accessed 19/04/2013.